The Powder came right on time for our Wednesday morning coaching session. 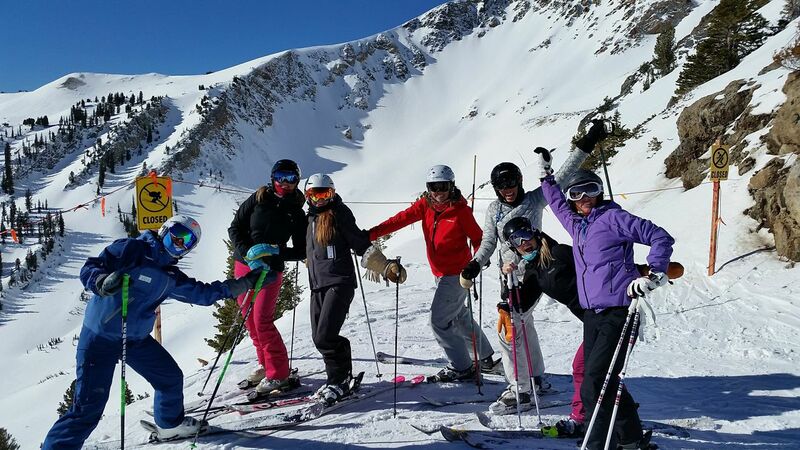 The Skimums ventured out to lower Old Ladies (don’t read anything into the name; we don’t judge the guys when they ski Baldy) then to Hoop’s and found some nice creamy powder to play in! Skimums found 5 simple rules to turned them into serious powder hounds. 1. It’s all about the flow: Think about flowing down the mountain in a smooth line making round turns with little edge angle. Create a rhythm! 2. Patience is key: In powder it takes more time for the skis to react to skier input. Steer your legs to create open round C-shaped turns, so that the skis keep flowing. Z-turns are harder to manage and interrupt the flow. 3. Speed is your friend: The skis are buried in the snow which creates more friction compared to groomed terrain. Powder slows you down and you need speed to keep moving! 4. Stay balanced over your feet: Contrary to common belief, you don’t lean back in powder. Ski in a balanced position (think “crouching tiger”). Conditions change with every turn, so you have to work constantly to stay in balance! Backseat skiing is not healthy for the knees and way too tiring!! 5. Build a platform: It is very helpful to narrow your stance, so that the skis build somewhat a single platform and are easier to turn. Most importantly, to become great in powder you have to keep skiing powder!Hopefully, we get another powder opportunity this week and we can even explore other secret places on the mountain!! Come out and join us for the last coaching session for the Skimums this season!! 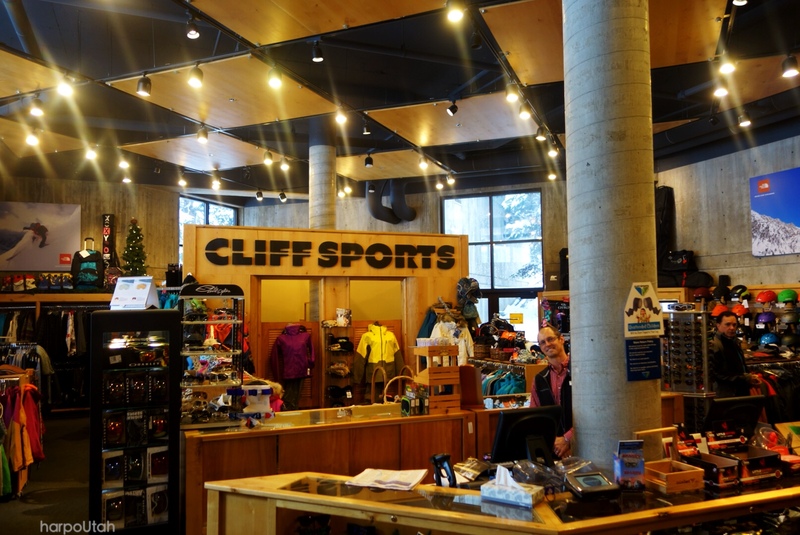 RSVP by Tuesday afternoon so we can have plenty of Mountain School instructors there. RSVP TODAY FOR FREE GROUP LESSON #3 THIS WEDNESDAY. Powder?!? Our technical focus in our second coaching session was turning our legs more than our upper body… What??? Yes, it is the truth: a turn starts with the body parts closest to the snow: the feet and the legs. Often times we use our shoulders or our hips to start a turn, we are twisting shoulders and arms uphill at the end of a turn, we flail with our arms to help us stay in balance… These movements are not very efficient and not always graceful 😉. The Skimums worked hard to keep their upper bodies disciplined, rotate their feet and legs to steer their skis through the turn, while keeping their belly buttons – and other body parts – directed towards the tip of the outside (or downhill) ski. We realized that the release of the energy created by twisting the lower half against the upper half of the body made it much easier to start a turn and to point the skis in the opposite direction. We also put our “schmearing” skills to use. We’re not carving into the turn. As Skimum Denice visualized, “It’s like spreading cream cheese on a bagel — the schmear.” As we release energy placing weight on that outside ski, gravity allows the entire bottom of the ski to coast downhill. More contact means more control over our direction and speed. To apply the new skills we found some crusty and then soft bumps, where we POINTED our belly buttons into the direction of travel, rotated our legs on TOP of the bump, SCHMEARED down the back side of the bump to control our speed, then GLIDED up the next bump! Like magic, Skimums found they had total control. Turning and shmearing, turning and shmearing… In control, with grace and efficiency!! Whatever the intended and desired outcomes are: skiing is based on a common set of fundamentals that can be universally applied. What does that mean for the Skimums? 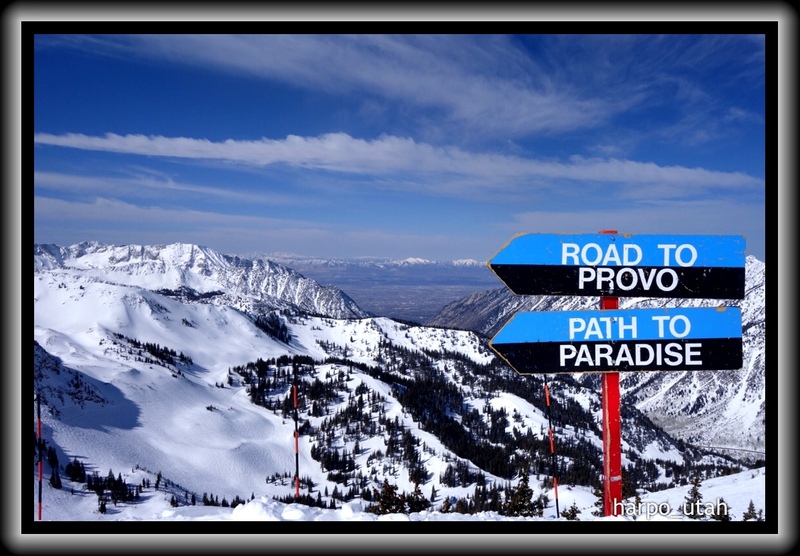 During our ski lessons at Snowbird we are working on improving our skiing to enjoy this beautiful mountain and all it has to offer even more! In session 1 last Wednesday, we focused on directing our balance toward the outside (or downhill) ski. Why? The outside ski is our workhorse. With the outside ski we get stability and we control the shape of the turn. If you did not have a chance to join us on Wednesday or if you want to review the one footed drills check out the video with Katie Fry and Nick Herrin. Join us next Wednesday for more tips and tricks to improve your game!! To make sure Mountain School sends enough instructors, please RSVP by Tuesday for the January 28th FREE Group Lesson (gratuity suggested) by sending comment below. In 2015, I’m looking at things differently, as in, laying my head on the edge of the sofa and finding cobwebs under the table differently, and I’m starting with “resolutions.” Resolutions, a New Year’s tradition of making them on the 1st and failing to keep them by the 4th, are hard for most people. This year, I’m working on reSolutions instead. A problem-solver by nature (What woman isn’t? ), I can usually identify and tackle most practical issues coming my way. I’m taking that approach to other more personal things in my life this year. The trick with Solutions is being honest about identifying the actual issues and then recognizing the skills and resources I already have to solve them or, as friends and hubby often remind me, let them go. Even better, unlike resolutions, Solutions are flexible and expected to fail now and then. My first Solution is to spend time on the mountain with friends in order to nourish my body and soul. 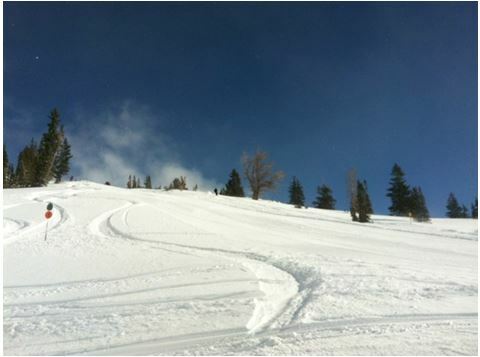 Skimums will meet starting THIS WEDNESDAY, January 7th at 9:30am at the Gadzoom Lift. Hope to see you all there. I Can’t Find the Plug! If Skimums preaches anything (and it doesn’t; well, not often), it’s to remember to recharge your batteries so you can give more to others. This Wednesday is your chance to do just that before the last holiday push! 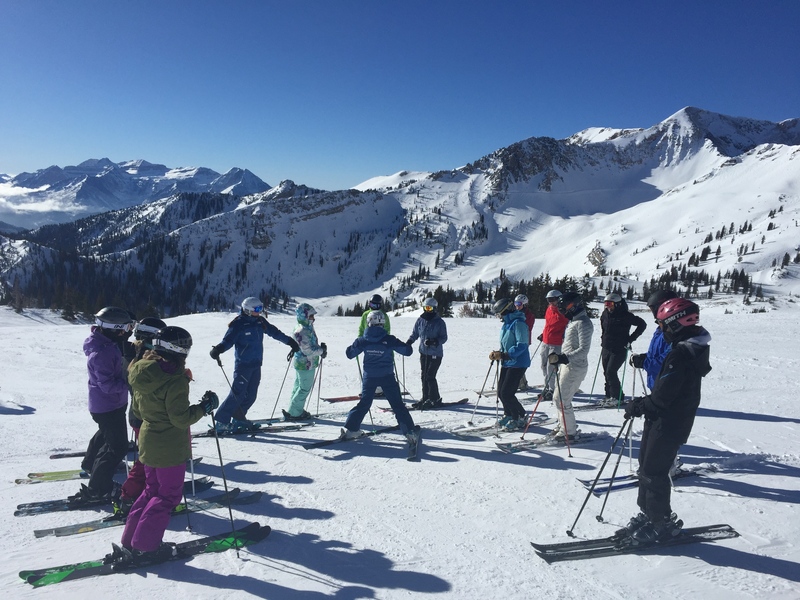 Snowbird is hosting a SkiTreat, a morning lesson by the Mountain School from 9-noon, lunch, spa tour and half-price access. The cost is only $40. #cheeperthantherapy (and a lot more fun). RSVP to the Mountain School today at (801)947-8222. This event will get you plugged in, charged up and ready to handle the holidays and the New Year.